Though the duration of his celebrity is yet to outlive that of his father’s, Femi Kuti is best known as the first son of renowned Nigerian afrobeat pioneer/singer/human rights activist/multi-instrumentalist/composer Fela Kuti. While it is obvious that Femi inherited his father’s musical talents, the younger Kuti has kept himself busy for many decades, preserving his father’s musical accomplishments and polishing up his own musical taste. Like his father, he is famed for using his songs to motivate, inspire, change the mindset of Africans. The musician’s career started way back in 1978 when he joined his father’s musical band, Eygpt 80. After banding together with his father as a keyboardist and saxophonist for eight years, Femi pulled out to set his own mark as a singer by forming his own band called Positive Force. Kuti dropped his debut record in the year 1995, after which he pushed forward another brilliant record titled: Shoki Shoki (released in 1999). Following the release of the record, Femi gained an immense popularity across the world, gaining a wider audience than many imagined. Kuti’s impressive career continued to flourish until the year 2001 when he broke out of his comfort zone by joining forces with Pennsylvania-born R&B/soul singer Jaguar Wright, American rapper/poet/film producer Lonnie Corant Jaman Shuka Rashid Lynn (stage name Common), and American hip-hop star Yasiin Bey, to produce the album, Fight to Win. The singer’s next collabo was with Los Angeles-based rock band, Jane’s Addiction. Femi’s stint with the band saw him tour the United States, after which he also embarked on several other tours many years later. The music star is known to have embarked on over six international tours, which include Larmer Tree Festival Salisbury UK (2015), Band on the Wall Manchester, UK (2015), Garforth Festival Garforth, Leeds (2015), Latitude Festival Suffolk UK (2015), Le Cabaret Sauvage Black Summer Festival, Paris (Afrobeat concert, 2015), Walthamstow Garden Party, London, Lloyd Park (2015), and The Lantern Bristol, UK 2015. Inheriting his father’s inimitable passion for both activism and music is one of the greatest decisions Femi has made in his lifetime and he sure deserves a pat on the back for it. But who is Femi Kuti? how old is he? Is he married or just focusing on his career? There are absolutely many things you probably didn’t know about the iconic singer and we have them all here. Read on! Femi Kuti was named Olufela Olufemi Anikulapo Kuti after his birth on June 16, 1962, in London, England, in the United Kingdom. His parents are Remilekun (mother) and Fela Ransome-Kuti (father). He was raised in Lagos partly by his mother, who abandoned his father shortly after his birth. Femi, however, moved in with his father in 1977, when he supposedly developed a strong interest in the Saxophone. He had his college education at Igbobi College, a Lagos-based institution of learning founded in 1932. The Afrobeat legend lost his mother in 2002 at the age of 60 while his father died of AIDS-related complications in 1997. The names of his siblings are Oluseun Anikulapo Kuti (brother, born 1983), Omosalewa Anikulapo Kuti (a lawyer), Oluwayeni Anikulapo-Kuti (dancer, born 1961), Kunle Anikulapo Kuti (brother, born 1971) Sola Kuti (born 1963, died in 1997). Femi Kuti has two sons, Ayomide Kuti and Made Anikulapo Kuti (born 1997). The latter came from his relationship with his former wife, Funke Kuti. 1. Femi Kuti is a proud owner of a club called The Shrine. It was officially launched in 2004 and doubles as the location of his live album Africa Shrine. 2. The singer spent 4 years outside the music industry as a result of personal setbacks. He, however, made a strong come-back in 2008 and released a powerful album titled: Day by Day in the same year. His next album captioned Africa for Africa was released two years later and was universally acclaimed within and outside the Nigerian music industry. 3. 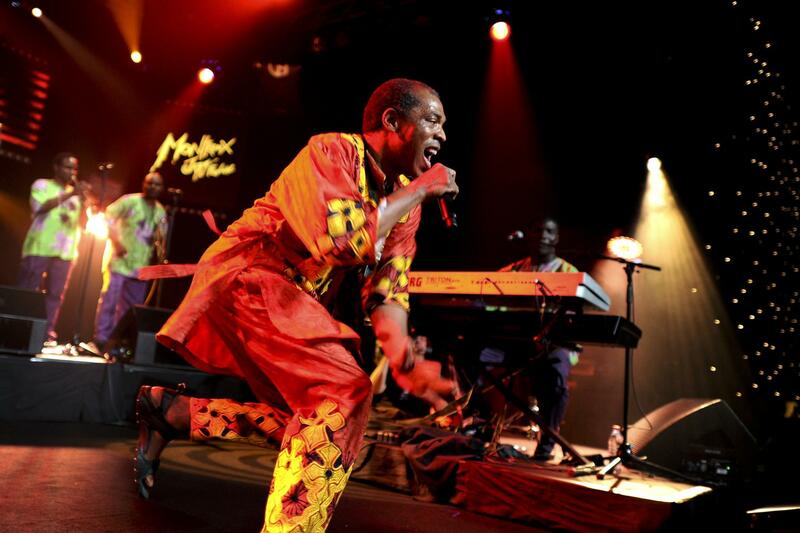 Femi Kuti’s robust career has earned him four Grammy nominations (2003, 2010, 2012 and 2013) in the “World Music” category but has never emerged the winner in the category. 4. The singer has performed at the Paris-based club “New Morning, annual German international jazz festival “Moers Festival”, and Festival d’Angoulême in France. He stormed the aforementioned performance centers in his budding years after he was invited to the shows by Royan-born musician Christian Mousset and the French Cultural Centre in Lagos. 5. Femi Kuti is a one-time judge on Nigerian Idol. He was featured on the Season 3 of the series. 6. The London-born Nigerian musician was inducted into the Headies Hall of Fame in 2012. 8. Fela Kuti’s son has collaborated with indigenous artists like record producer/hip-hop recording star M.I (real name Jude Abaga), rapper Sound Sultan and African Queen crooner Tuface Idiibia, popularly known by his stage name 2face. 9. The Day by Day hitmaker’ made his debut appearance with his brother, Seun Kuti on April 24, 2015, at the 2 Kings concert. 10. On May 15, 2017, the iconic Afrobeat star smashed the World record for the longest single note held on a saxophone with a record of 51 minutes, 35 seconds. He achieved the feat at the New Africa Shrine.